The Shops at Liberty Place – This classic indoor mall is conveniently located downtown and features all the top national retailers, including LOFT, J. Crew and Jos. A. Bank. King of Prussia Mall – Located slightly outside the city, this massive complex features more than 400 stores, and is the nation’s largest shopping mall. Antique Row – Explore an eclectic combination of vintage shops and new, modern boutiques at this charming and historical destination. The Bellevue – Looking for luxury goods? Head to this Beaux Arts building, which is home to Polo Ralph Lauren, Tiffany & Co., Williams-Sonoma and more. 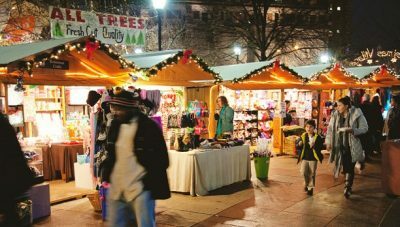 Love Park Christmas Village – Enjoy a Medieval setting at this German market, and shop for glass ornaments, wooden toys and nutcrackers while you munch on freshly baked gingerbread. The Gallery at Market East – Conveniently situated in Center City, this popular mall features all the popular brands like Old Navy and Burlington Coat Factory. After you’ve shopped – and before you’ve dropped – return to your plush accommodations at our stylish hotel. Kick your feet up, order a cocktail and relax. Do you have questions about shopping in Philadelphia, things to do this holiday season, or lodging at our luxury hotel? Please contact us today to learn more.